Eight straight goals helped the United States open the 2014 FIL World Championship, presented by Trusted Choice, with a big win over Canada, its championship game opponent in each tournament since 1998. Flipping a 3-0 deficit early in the second quarter to an 8-3 lead deep in the third, the run powered an eventual 10-7 victory for the defending world champion. 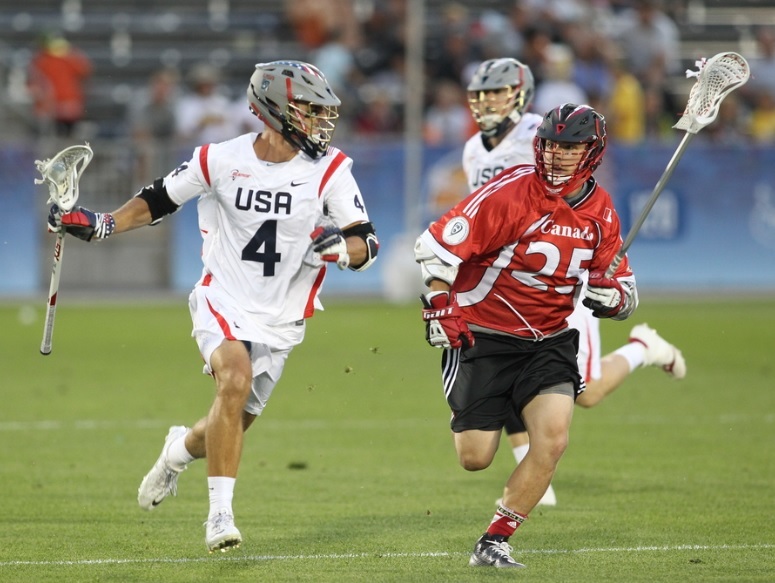 Midfielder Paul Rabil – the Best and Fairest Player (MVP) of the 2010 world championship in Manchester, England – sparked the rally, assisting on two of the first three scores and scoring unassisted on the fourth goal to give Team USA its first lead of the day. He added another late as the U.S. held off the pesky Canadians, who scored three of the final four goals to keep the pressure on as time wound down. Jesse Schwartzman and Team USA’s defense kept a very good Canada offense in check. The Canadians were held scoreless over a 30-minute stretch during the U.S. run. Schwartzman made seven saves to earn the win, while Team USA allowed Canada just 20 shots on the night, compared to 40 that its offense generated. Chris Eck (8-for-16) and Greg Gurenlian (4-for-5) also played a big role for the U.S., locking down the advantage at the “X” over Canada’s Geoff Snider (9-for-21). Five of those wins came on violations, while Eck and Gurenlian were whistled three times. Team Canada goalie Dillon Ward was outstanding in the losing effort, totaling 18 saves to help his team keep it close despite the U.S. run. Canada’s offense just ran dormant for that long period and never could get closer than within three of the U.S. Zack Greer scored twice for Canada, while Mark Matthews had a goal and an assist. Rob Pannell and Kevin Buchanan, with two goals and an assist apiece, both also had solid games in their world championship debuts for Team USA. In total, seven players scored goals for coach Richie Meade’s squad. Six of the 10 goals were assisted. 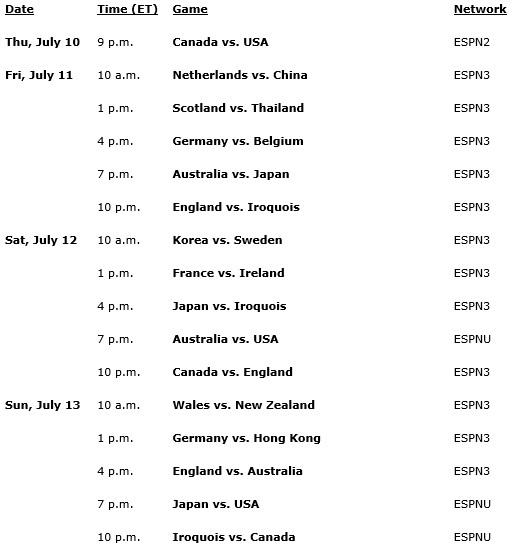 Both teams have an off day as the rest of the tournament kicks off with games all dayFriday. 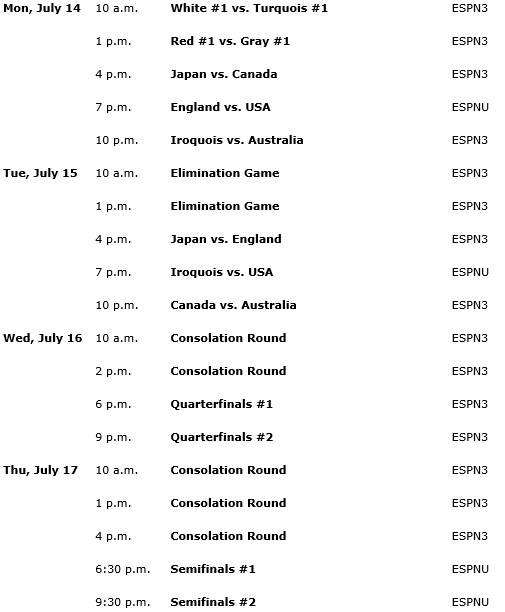 Team USA looks to stay perfect in Blue Division play with Australia – third place in 2010 – on Saturday at 5 p.m. Canada takes on England at 8 p.m. immediately following that contest. The 2014 MLL All-Star Game was a matchup of stars that remained tightly contested until the final seconds, but it was Coca-Cola All-Star Game MVP Rob Pannell who scored the game-winning goal, with just seven seconds to spare in the game, to give Team USA the 10-9 victory over Team MLL. The first quarter had much of what fans expected from such a high-caliber matchup. Although Team MLL initially had trouble maintaining possession, a goal by Team USA’s Kevin Leveille seemed to wake them up. After that goal, each possession featured quality offensive movement and athletic saves by both USA’s Jesse Schwartzman and MLL’s Jordan Burke. Justin Turri answered with a goal for Team MLL, but Leveille, the league’s all-time leading goal scorer, notched his second of the night on a pass from Pannell to put USA back in front. Just before the quarter expired, MLL’s Peter Baum scored to knot things up at 2-2. The second quarter began with quick turnovers from each team, but it was Team USA who finally held onto the ball long enough to score, as Garrett Thul charged the net and snuck one past Burke. After MLL tied the game up once again when Joe Walters scored on a pass from former Hamilton Nationals teammate Kevin Crowley, USA finally gave themselves some breathing room with two consecutive goals from Dave Lawson and Kevin Buchanan. Team MLL refused to let the game get away from them, as Matt Danowski scored on a dive around the net to bring the team back within one. However, it was Burke who deserved much of the praise in the final moments of the second quarter, making multiple outstanding saves to preserve the score at 5-4 entering halftime. The biggest names in the game come together this summer in Denver, where Team USA seeks to take home a second straight gold medal against a powerful slate of opponents headlined by 2006 world champion and 2010 runner-up Canada. From its physical heft to its metaphorical meaning, the Tewaaraton Award carries some serious weight in the lacrosse world. Several past winners tell us the stories of their trophies. 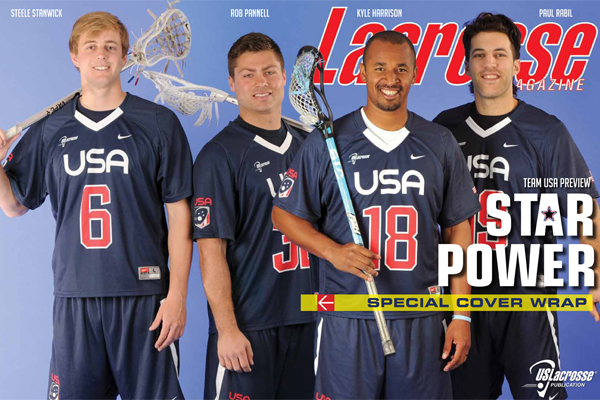 An in-depth intreview over oysters with lacrosse mega-star Paul Rabil, a feature on the self-dscribed dorky defenseman known as Fletch and the unlikely union of Rob Pannell and Steele Stanwick headline this special 15-page package leading into July’s FIL World Championships in Denver. Lacrosse Magazine follows the world-renowned women’s lacrosse goalie in her historic pursuit of a roster spot in Major League Lacrosse, becoming the first female to break the MLL barrier with the New York Lizards. US Lacrosse hopes to ‘move the nedle’ to diversify the sport so it reflects the demographics of all communities. Once a member of New Hampshire’s NCAA championship squad in the early 1980’s, Katey Stone is a leading light in the women’s hockey world, having coached the U.S. women at the recent Sochi Olympics. She talks on the similarities between players of the two sports and her expriences at the top of both games. Loyola’s Australian Sensation Marlee Paton puts on a free-position shooting clinic, while Team USA’s Ned Crotty breaks down how to victimize a short stick d-middie if you happen to find yourself covered by one. Penn State’s Maggie McCormick wanted to be a marine biologist, but she’s found herself on a career path that supports her aptitude for working with people. She answers our questions on lacrosse and life in this month’s Give and Go interview. A record total of 746,859 players competed on organized lacrosse teams in 2013, as reported in the annual US Lacrosse Participation Report released today. The growth rate from last year (722,205) was 3.4 percent and youth participation topped 400,000 for the first time ever. The 403,770 youth participants represent over half of the total playing population and youth participation grew 3.6 percent over 2012. Roughly two-thirds of the youth participants are boys (265,428) and more players came from New York (55,298) than any other state. Lacrosse continues to be the fastest-growing sport at the high school level, and a total of 290,046 players competed in 2013. According to data from the NFHS, from 2008 to 2013, a total of 621 schools added boys’ teams and 588 schools added girls’ teams. Those figures represent a 34 percent increase in the number of boys’ programs and a 36 percent increase in the number of girls’ programs, easily outdistancing other sports in terms of percentage growth. The second-fastest growing sports are water polo (13 percent for boys) and ice hockey (14 percent for girls). Lacrosse is also the fastest-growing NCAA sport, and more than 35,000 players competed on varsity, club or junior college teams in 2013. A staggering 60 new varsity programs were added in 2013, including eight new NCAA Division I programs. 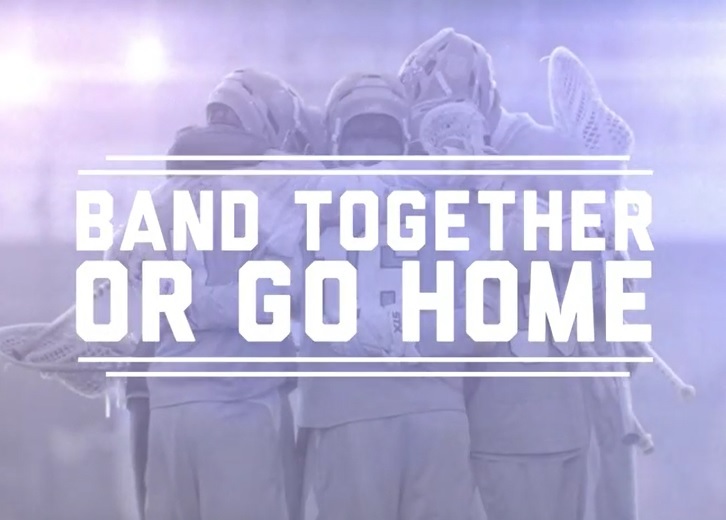 US Lacrosse has produced the Participation Report annually since 2001, and over that time span the number of players has grown 194 percent, from 253,901 to 746,859. This survey counts only play on organized teams, and does not count leisure-time play of the sport. 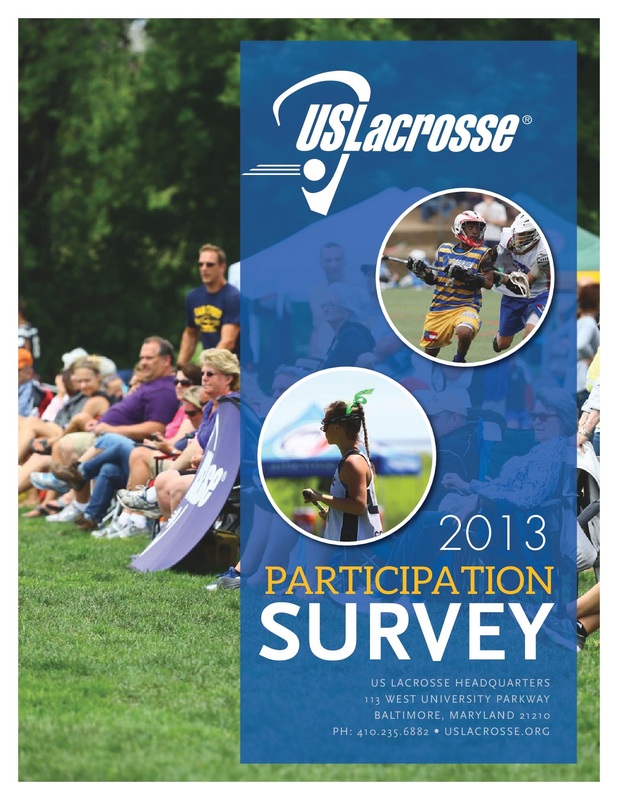 The primary source of data for this report is provided by the 67 US Lacrosse regional chapters. Each chapter reports detailed participation at the youth level, and significant data is also obtained from US Lacrosse membership records, the National Collegiate Athletic Association, the National Federation of State High School Associations and LaxPower.com.